I just looked on Darkwood Armory's website and saw that Scott has updated it with lots of really good looking pieces. I got to see some of these at the recent WMAW, and let me say that these are really nice for the price. Scott's main market has primarily been rapier fencers, so he's mostly catered to this niche by provided reasonably priced rapiers that really capture the essence of the period weapons with some concessions. Through time, though, he's really become better and better at making his rapiers even nicer without really increasing the cost, and he's a quite capable of making some really nice custom hilts if asked. 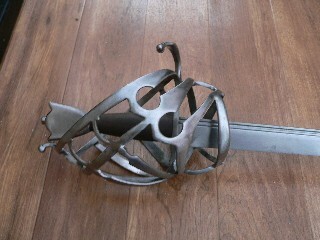 Darkwood has long been my favorite maker of fencing rapiers, but he carries sharp blades, too. The new products look great. I've already committed to one of the new schiavone he's offering as soon as I become financially solid again. I hope Scott can work out all the bugs and broken links on his site. I hope Scott can work out all the bugs and broken links on his site. Yeah, me too. I think in the past Scott may have overlooked how important having a good website is to today's business world. His cuphilt link is broken, and those are some of his most surprising pieces in terms of quality to price. You know, if I hadn't just booked my vacation schedule, Scott would have at least one item less on his "in stock" page. Quite possibly more than one. I've always really liked the A.V.B. Norman type 43 style of hilt, and I think the Darkwood example that's in stock does a good job of capturing the the lines and cross section of the bars. I like those two new English baskethilts. The schiavona is very nice too. It's great to see some new baskethilts on the market, you can never have enough of them. There is a lot of beautiful stuff there. It's great that someone has made a schiavona available to us. The English baskethilts are terrivic, as well. I really must get something from Darkwood -- probably some variation on their teardrop plate Pappenheimer. Why not a schiavona? You know you want it, Roger. half of the total amount is due before we begin work and the balance is due two weeks before shipping. We are quite versatile. Modesty aside, hardly any construction or decoration technique is beyond us. If we can see it, there's a very good chance that we can make it." 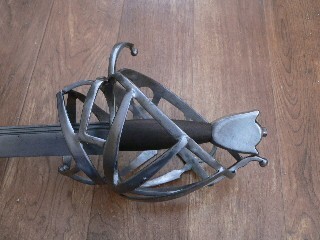 I'm pretty sure I asked Scott about doing one when he finished the Side-sword(see review here http://www.myArmoury.com/review_dw_ss.html) that I had gotten from him. Right now, haven't the funds for doing so. Timothy Lyon had sent me these pics of his Darkwood schiavona to post. 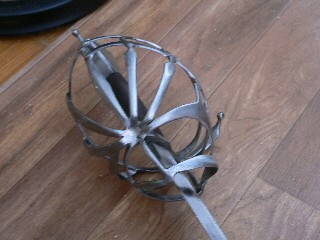 According to Tim, he went with a simpler basket design and has the bouting backsword blade (hence the rubber blunt taped onto the tip). He specifically requested no thumb ring, as he uses this sometimes in the other hand. Bill, I don't know how I missed this post. Damn. I like this pattern a lot. When I get financially solid in 2006 I'm going to have to buy both styles from Scott and add them to the schiavona collection. That Schiavona looks really nice. Scott does both kinds of blades, you specify what kind you want at time of ordering and when complete you get what you asked for. 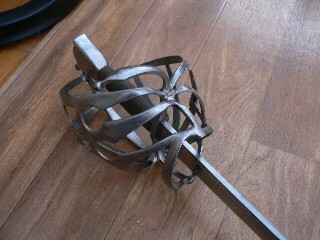 Scott does awesome work, just ordered a custom cup hilt from him. Am very excited about it! I'm getting my 3rd rapier from Scott in about 4-6 weeks, so far I have a 3 ring with Darkwood Armory blade, a 2 ring with Del-Tin bated blade and my new one coming to me will be a cup hilt with exactly pictured on his cup hilt page the 3rd one down with a wooden handle instead of the leather wrap and without the guardopolvo. I have one of his old shell-hilt epees that I have since converted to schlager, and a two-post swept with a del TIn practice rapier in it. Does anyone have any experience with his house-brand blades? Does anyone have any experience with his house-brand blades? All mine are older, so they have the Del Tin blades on them, but a few of my students have his standard house-brand blades, and they seem comparable. Haven't noticed any big differences so far.